Instantly acquire all the knowledge you need to pass as an expert in the world of cats. Never again confuse a Cornish Rex with a type of pasty, a Turkish Angora with a cardigan, or a LaPerm with a bad hair day. Bask in the admiration of your fellow cat people as you pronounce confidently on a tendency for anthropomorphism among feline fans (ascribing human characteristics to animals), assure them that it isn't catching, and effortlessly hold your own against the most pompous of `ailurophiles' - especially if they don't know the difference between vomeronasals and vibrissae. The chances are they won't know the real reason that ancient Egyptians revered their cats as demigods either. 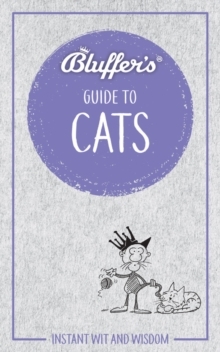 Written by experts and offering readers the opportunity to pass off appropriated knowledge as their own, the Bluffer's Guides provide hard fact masquerading as frivolous observation in one witty, easy read.